Much of the focus for improving the 401(k) system has been on increasing participation. But scant attention has been paid to plugging retirement plan leakage. Today, America faces a different, more down-to-earth challenge: delivering our citizens a comfortable and timely retirement. And similar to the moon landing – a ‘small step’ in the right direction can have a huge impact on the course of our lives. At no time has our retirement challenge been more evident than during the first few weeks of 2017, with multiple articles pointing out deficiencies of 401(k) plans as the primary vehicle for retirement savings. Much of the focus for improving the 401(k) system has been on increasing participation, and statistics indicate that this concern is well-founded. Unfortunately, scant attention has been paid to plugging retirement plan leakage, particularly cash out leakage – a problem that drains o ur retirement system of billions of dollars annually. There is one solution – auto portability – that has the potential to plug cash out leakage and increase 401(k) plan participation. If fully implemented, auto-portability could drive significant improvements in our nation’s retirement readiness. And unlike a manned mission to the moon, auto-portability can be delivered by the private sector, at no cost to the American taxpayer. The ultimate goal of having every working American saving for retirement is generally a function of two challenges: 1) giving employees access to a retirement plan in the workplace and 2) having employees participate in that plan. The Bureau of Labor Statistics (BLS) tracks these rates on an annual basis. In 2016, 66% percent of private industry workers had access to a retirement plan, and of those who did have access, 71% participated. Together, these statistics reflect a significant coverage gap. Total plan participation increased from 45% in 1979 to 46% in 2013. Thus, the 401(k) era has had little impact on overall participation in retirement plans, due the disappearance of the traditional defined benefit plan from corporate America’s menu of benefits. 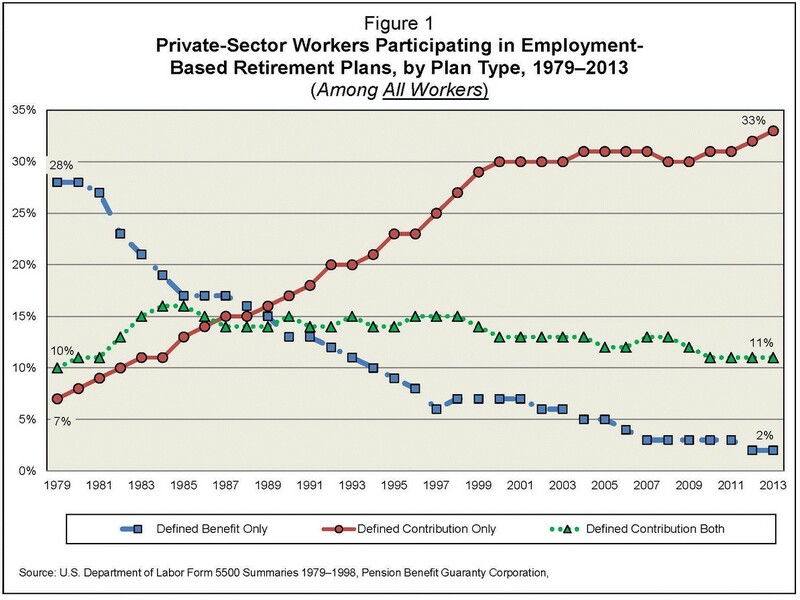 After plateauing from 2005 – 2007, defined contribution plan participation has trended up since the Pension Protection Act (PPA) was passed in 2006. Not coincidentally, PPA provided safe harbor protections for plans offering auto-enrollment, removing a barrier to a plan feature that has unquestionably driven increased retirement plan participation. According to the Plan Sponsor Council of America’s 59th Annual Survey of Annual Profit Sharing and 401(k) Plans, about 58% of all plans have now adopted an auto-enrollment feature. Unfortunately, not all industries have enthusiastically embraced auto-enrollment. An analysis of IRS Form 5500 data shows certain industries lagging in auto-enrollment adoption. In 2013, there were 109 plans in the Food & Beverage industry, with almost 1.2 million participants. Of those 109 plans, only 26 (24%) had an automatic enrollment feature, whereas 83 (76%) did not. Average balances were 10.2% lower in the automatic enrollment group, compared to the group without an automatic enrollment feature. Almost 27% of the automatic enrollment group’s participants were separated, vs. 14% in the non-automatic enrollment group. Thus, when compared to the overall market, it’s easy to conclude that high-turnover industries (ex – Food & Beverage, Retail, etc.) are reluctant to adopt auto-enrollment, due to the high percentage of costly small accounts left behind when participants separate. By removing frictions and solving the small account problem, we can overcome another important barrier to auto enrollment and drive increased 401(k) participation. Auto-portability is the routine, standardized and automated movement of an inactive participant’s retirement account from a former employer’s retirement plan to their active account in a new employer’s plan. In 2016, Retirement Clearinghouse announced the development of an Auto Portability Simulation (APS) to demonstrate the impact of auto-portability over a generation of retirement savers. The key scenario — in which auto-portability is widely adopted over a 10-year period and remains in force for a generation — showed that small account cash-outs could be reduced by two-thirds from the current annual rate of $7 billion to less than $2.5 billion per year. The APS also demonstrated that auto-portability could generate more than $115 billion in new employer-plan savings for the current and next generation of retirement plan participants. Finally, the number of participants annually rolling their sub-$5,000 accounts into their new-employer plans increased from an estimated 200,000 today to more than 3 million per year — affecting nearly 76 million participants over the simulation’s timeframe. Not included in the APS was the potential impact on retirement plan participation. A 2014 Aon Hewitt Universe Benchmarks report indicated that plans with auto-enrollment had an 85% participation rate on average, compared with 62% for plans without auto enrollment. Applying the Aon Hewitt figures to the Food & Beverage industry, adoption of auto-enrollment at industry averages could conservatively add 151,000 additional participants, a 13% increase in participation! Small improvements to the 401(k) plan system that remove frictions and encourage proper behavior can yield big results. Imagine the impact on total retirement plan participation if there were a mandate for auto-enrollment, auto-portability and an increase to $15,000 in the account balance eligible for mandatory distributions (almost 50% of all accounts). America would take a giant leap towards solving our retirement crisis.